Apple announced iMessage Apps at this year’s WWDC ’16 Keynote. Google showcased Google Bot at I/O. Microsoft, Amazon and Facebook each have their own AI tools and bot platforms for brands to engage with their customers, but what exactly does that mean? Are we going to just chat away with Google Bot in our messaging apps and order pizzas through SMS? That depends on whose bot platform you interact with. Each one has their own spin on the mobile user experience. Today we’ll dig into mobile bot UX. Apple believes that bots won’t be sentient anytime soon. In fact, Apple doesn’t even mention the term bots anywhere in their marketing materials, however are offering developers the ability to develop messaging apps within iMessage itself. This will allow companies to build experiences like ordering a pizza or an Uber without ever having to leave iMessage. Apple believes the interaction between the customer and the iMessage app require both conversation and buttons. Allow me to explain. If a bot can’t understand mistakes you enter in chat, the entire experience is ruined, and you might as well pick up the phone or use your pizza app like an animal. Apple wants to fix this problem with UI buttons. Make a chat request, but use buttons to navigate through the decision tree so you don’t get frustrated with spelling mistakes and unrecognizable queries. 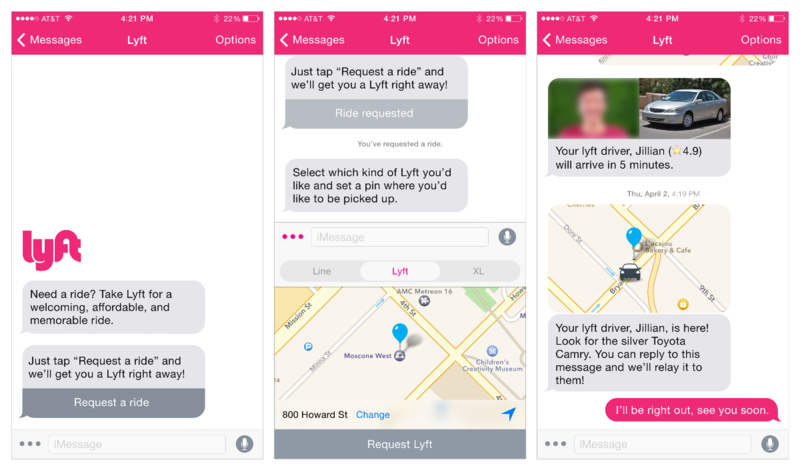 Matt Galligan, Ex-CEO of Circa shows us how you would order a cab straight from iMessage. Facebook, like Apple is also a believer in button UI’s within chat. In fact, Facebook was the first of the Big Four to roll this out. There are already hundreds of Messenger apps that let you order cabs, tell you the weather and even order pizza’s through chat and buttons. Messenger Bots have a slight edge for Apple. Facebook can process natural language and reduce the number of chat errors that occur in the conversation. This mix of conversations plus buttons may be the holy grail of mobile e-commerce. Let’s talk about Google. Google might as well have been the first company to successfully develop artificial intelligence at scale, successfully on the web. Google can handle any search you throw at it, and we tell all of our secrets to the holy search box. Google wants to take this accuracy and let you converse with Google Bot within their Allo messaging app. Allo will learn how to respond to requests for you, and give you relevant information based on where you’ve shopped, what’s on your calendar, and where your’e planning on going by popping up response buttons. Cool stuff, big brother. While Google hasn’t officially rolled out an e-commerce/developer platform to plug into Allo, you can bet they are planning on this, and with the speed and accuracy of Google search, we may one day have a full text conversation with Google Bot and run our errands. Brands need to engage where their customers are. There is no denying that iOS & Android have won the mobile wars and carry the majority of the distribution required to reach out to your customers. Building a messaging app or bot is a great way to interact and transact with a customer base that is increasingly chatting and snapping at the same time. Tappforce develops engaging chat bots on iOS & Android.